New. 100% Money Back Guarantee. Brand New, Perfect Condition. We offer expedited shipping to all US locations. Over 3, 000, 000 happy customers. 320 p. DC Modern Classics . Fine. 100% Money Back Guarantee. Brand New, Perfect Condition. We offer expedited shipping to all US locations. Over 3, 000, 000 happy customers. 320 p. DC Modern Classics . New. 320 p. DC Modern Classics . I bought a used copy for really cheap and I was happy with what I got. The book was almost new! I read it once and now I'm reading the story again. It is a great book that I'd recommend reading. If you don't have a copy, buy one. I?m sort of a low to mid-level geek. I love science fiction but I?ve never played an RPG or been to a comic book convention. I grew up reading a comic series and it was my one and only for a while, but I?ve always been interested in this genre and I?ve been delving into it more lately. I have to say all that because to some people this is a holy book, so if you?re not madly in love with it you need to tread softly and explain yourself. I like ?Watchmen.? It?s a very good book. I may have even loved it while I was reading it, but I have only read it once; it hasn?t made it onto my ?again and again? list. I keep trying to describe it and I come up with words like ?heavy,? ?meaty,? and ?dark.? They call it a graphic novel for a reason: it?s a grown-up person?s book presented with pictures. The themes are dark. The heroes are mostly human, with all of the vices, short-comings, and problems that implies. It isn?t an uplifting or particularly moving tale, but it?s not exactly depressing either. I don?t quite know what to say about it. It?s not clear what Moore wanted me to take away after reading his work, which is part of why it?s compelling, I guess. The plot wraps up neatly but you?re left puzzling over what to do about it. It?s a good sort of thing if you like that sort of thing - which I do, I just don?t love it. Maybe it?s because I didn?t fall in love with any of the characters. It didn't change my life, but it was a nice way to spend some time. I never thought I'd be into graphic novels because I never read any comic books, boy was I wrong. I bought it for my husband for his birthday and he loved it. He couldn't stop reading it. I decided to see what he liked so much and once I picked it up, I couldn't put it down. 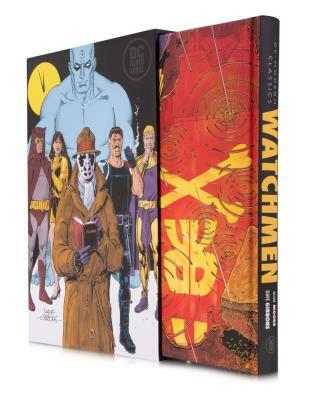 To be honest, I was alittle turned off The Watchmen by all of the hype given this graphic novel, so finally with the new movie possibly coming out in 2009 I figured I should finally read the entire story. I have to say I wasn't dissappointed. Even thou the story has alot of flash backs it was easy to follow. I would have liked alittle more backround on some of the characters, the person we know the most about is the one with the greatest powers, Dr. Manhatton. For the approximately $10.00 I spent to purchase this book it was well worth it.